For a more general discussion of skepticism, see Skepticism. Nevertheless, a Pyrrhonian global skeptic labors under no such modern constraint, since Pyrrho only alleged that he, personally, did not know anything. He made no statement about the possibility of knowledge. Nor did Arcesilaus feel bound, since he merely corrected Socrates's "I only know that I know nothing" by adding "I don't even know that", thus more fully rejecting dogmatism. Most philosophies have weaknesses and can be criticized and this is a general principle of progression in philosophy. The philosophy of skepticism asserts that no truth is knowable, or that truth is at best only probable. An argument commonly made but limited to science is that the scientific method asserts only probable findings, because the number of cases tested is always limited and because the tests constitute perceptual observations. A criticism of skepticism generally is that there is a contradiction involved in claiming that the proposition that “no truth is knowable” is knowably true. The here is one hand argument is another relatively simple criticism that reverses the skeptic's proposals and supports common sense. Pierre Le Morvan (2011) has distinguished between three broad philosophical approaches to skepticism. The first he calls the "Foil Approach." Skepticism is treated as a problem to be solved, or challenge to be met, or threat to be parried; its value, if any, derives from its role as a foil. It clarifies by contrast, and so illuminates what is required for knowledge and justified belief. The second he calls the "Bypass Approach" according to which skepticism is bypassed as a central concern of epistemology. Le Morvan advocates a third approach—he dubs it the "Health Approach"—that explores when skepticism is healthy and when it is not, or when it is virtuous and when it is vicious. The Western tradition of systematic skepticism goes back at least as far as Pyrrho of Elis (b. circa 360 BCE) and arguably to Xenophanes (b. circa 570 BCE). Parts of skepticism also appear among the "5th century sophists [who] develop forms of debate which are ancestors of skeptical argumentation. They take pride in arguing in a persuasive fashion for both sides of an issue." According to an account of Pyrrho's life by his student Timon of Phlius, Pyrrho extolled a way to become happy and tranquil. The main principle of Pyrrho's thought is expressed by the word acatalepsia, which connotes the ability to suspend judgment between doctrines regarding the truth of things in their own nature as against every dogma a contradiction may be advanced with equal justification. Pyrrhonists are not "skeptics" in the modern, common sense of the term, meaning prone to disbelief. They had the goal of αταραξια (ataraxia - peace of mind), and pitted one dogma against another to undermine belief in dogmatic propositions. The objective was to produce in the student a state of epoché towards ideas about non-evident matters. Since no one can observe or otherwise experience causation, external world (its "externality"), ultimate purpose of the universe or life, justice, divinity, soul, etc., they declared no need to have beliefs about such things. The Pyrrhonists pointed out that people ignorant of such things get by just fine before learning about them. They further noted that science does not require belief and that faith in intelligible realities is different from pragmatic convention for the sake of experiment. For each intuitive notion (e.g. the existence of an external world), the Pyrrhonists cited a contrary opinion to negate it. They added that consensus indicates neither truth nor even probability. The works of Sextus Empiricus (c. 200 CE) are the main surviving account of ancient Pyrrhonism. By Sextus' time, the Academy had ceased to be a skeptical or probabilistic school, and argued in a different direction, incorporating aspects of empiricism into the basis for evaluating knowledge, but without the insistence on experience as the absolute standard of it. Sextus' empiricism was limited to the "absolute minimum" already mentioned — that there seem to be appearances. 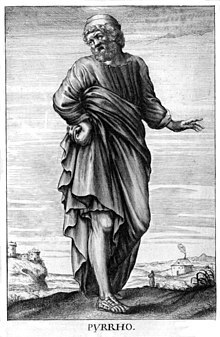 Sextus compiled and further developed the Pyrrhonists' skeptical arguments, most of which were directed against the Stoics but included arguments against all of the schools of Hellenistic philosophy, including the Academic skeptics. A common anti-skeptical argument is that if one knows nothing, one cannot know that one knows nothing, and so may know something after all. However, such an argument is effective only against the complete denial of the possibility of knowledge. Sextus argued that claims to either know or not to know were both dogmatic and as such Pyrrhonists claimed neither. Instead, they claimed to be continuing to search for something that might be knowable. Sextus, as the most systematic author of the works by Hellenistic sceptics which have survived, noted that there are at least ten modes of skepticism. These modes may be broken down into three categories: one may be skeptical of the subjective perceiver, of the objective world, and the relation between perceiver and the world. His arguments are as follows. Critics claiming Sebond's arguments are weak show how egoistic humans believe that their logic is superior to others’. The historical Buddha asserted certain doctrines as true, such as the possibility of nirvana; however, he also upheld a form of skepticism with regards to certain questions which he left "un-expounded" (avyākata) and some he saw as "incomprehensible" (acinteyya). Because the Buddha saw these questions (which tend to be of metaphysical topics) as unhelpful on the path and merely leading to confusion and "a thicket of views", he promoted suspension of judgment towards them. This allowed him to carve out an epistemic middle way between what he saw as the extremes of claiming absolute objectivity (associated with the claims to omniscience of the Jain Mahavira) and extreme skepticism (associated with the Ajñana thinker Sanjaya Belatthiputta). ^ a b c d e f g h i 1923-, Popkin, Richard Henry, (2003). The history of scepticism : from Savonarola to Bayle. Popkin, Richard Henry, 1923- (Rev. and expanded ed.). Oxford: Oxford University Press. ISBN 9780195355390. OCLC 65192690. ^ Williams, Michael (2001). "Chapter 5: Agrippa's Trilemma". Problems of Knowledge: A Critical Introduction to Epistemology. Oxford University Press. p. 61. ISBN 978-0192892560. ^ Francisco Sanchez, That Nothing is Known, Cambridge University Press, 1989. ^ a b "SKEPTICISM". Encyclopedia of Empiricism. 1997. ^ Le Morvan, Pierre (1 February 2011). "Healthy Skepticism and Practical Wisdom". Logos & Episteme. ^ Vogt, Katja (10 February 2019). Zalta, Edward N., ed. The Stanford Encyclopedia of Philosophy. Metaphysics Research Lab, Stanford University – via Stanford Encyclopedia of Philosophy. ^ Beckwith, Christopher I. (2015). Greek Buddha: Pyrrho's Encounter with Early Buddhism in Central Asia (PDF). Princeton University Press. pp. 22–23. ISBN 9781400866328. ^ On the ten modes, see Sextus Empiricus. Outlines of Skepticism I.35–164. ^ a b 1962-, Dutton, Blake D.,. Augustine and academic skepticism : a philosophical study. Ithaca. ISBN 9781501703553. OCLC 951625897. ^ 1922-2012,, Hick, John, (1970). Classical and contemporary readings in the philosophy of religion (2nd ed.). Englewood Cliffs, N.J.,: Prentice-Hall. ISBN 978-0131352698. OCLC 90682. ^ M.,, Clarke, Desmond (2016). French philosophy, 1572-1675 (First ed.). Oxford, United Kingdom. ISBN 9780198749578. OCLC 923850410. ^ a b Skepticism in the modern age : building on the work of Richard Popkin. Maia Neto, José Raimundo, 1959-, Paganini, Gianni, 1950-, Laursen, John Christian., Skepticism from the Renaissance to the Enlightenment: a Conference in Memory of Richard H. Popkin (1923-2005) (2007 : Belo Horizonte, Brazil). Leiden: Brill. 2009. ISBN 9789047431909. OCLC 700517388. ^ A companion to early modern philosophy. Nadler, Steven M., 1958-. Malden, Mass. : Blackwell Pub. 2002. ISBN 978-0631218005. OCLC 49394201. ^ Grotius to Gassendi. Chappell, V. C. (Vere Claiborne), 1930-. New York: Garland Pub. 1992. ISBN 978-0815305767. OCLC 24846343. ^ Missner, Marshall (1983). "Skepticism and Hobbes's Political Philosophy". Journal of the History of Ideas. 44 (3): 407–427. doi:10.2307/2709174. JSTOR 2709174. ^ Black, Sam (1997). "Science and Moral Skepticism in Hobbes". Canadian Journal of Philosophy. 27 (2): 173–207. JSTOR 40231980. ^ Laursen, John Christian; Paganini, Gianni (2015). Skepticism and political thought in the seventeenth and eighteenth centuries. Laursen, John Christian,, Paganini, Gianni, 1950-. Toronto. ISBN 9781442649217. OCLC 904548214. ^ Batnitzky, Leora (December 2003). "SPINOZA'S CRITIQUE OF RELIGIOUS AUTHORITY: SPINOZA'S CRITIQUE OF MIRACLES". Cardozo Law Review. 25: 57. ^ a b 1985-, Matytsin, Anton M., (2016-10-03). The specter of skepticism in the age of Enlightenment. Baltimore. ISBN 9781421420523. OCLC 960048885. ^ a b Lennon, Thomas M. (2002). "What Kind of a Skeptic Was Bayle?". Midwest Studies in Philosophy. 26–1: 258–279. ^ David Hume, A Treatise of Human Nature (1739), Book I, "Of the Understanding" and David Hume, An Enquiry Concerning Human Understanding (1748). 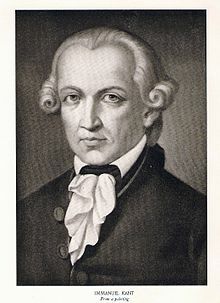 ^ See G. E. Schulze, Aenesidemus (1792), excerpted in Between Kant and Hegel: Texts in the Development of Post-Kantian Idealism, Translated with Introductions by George di Giovanni and H. S. Harris, Indianapolis, Indiana: Hackett Publishing, 2000. See also Frederick C. Beiser, The Fate of Reason: German Philosophy from Kant to Fichte, Cambridge, Massachusetts: Harvard University Press, 1987; Chapter 9, "Schulze's Skepticism". ^ See (1) H. S. Harris, "Skepticism, Dogmatism and Speculation in the Critical Journal" (1985), in Between Kant and Hegel: Texts in the Development of Post-Kantian Idealism, Translated with Introductions by George di Giovanni and H. S. Harris, Indianapolis, Indiana: Hackett Publishing, 2000; (2) G. W. F. Hegel, "On the Relationship of Skepticism to Philosophy, Exposition of its Different Modifications and Comparison of the Latest Form with the Ancient One", Translated by H. S. Harris, in di Giovanni and Harris (2000) (cited just above); and (3) Michael N. Forster, Hegel and Skepticism, Cambridge, Massachusetts: Harvard University Press, 1989. ^ Georg Wilhelm Friedrich Hegel, The Encyclopedia Logic (1830), § 28, pp. 65–68, Translated by T. F. Garaets, W. A. Suchting, and H. S. Harris, Indianapolis, Indiana: Hackett Publishing, 1991. ^ 1968-, Sedley, David Louis, (2005). Sublimity and skepticism in Montaigne and Milton. Ann Arbor: University of Michigan Press. ISBN 9780472115280. OCLC 60715259. ^ Kalupahana, David J. A History of Buddhist Philosophy: Continuities and Discontinuities, page 21. ^ The Cowherds. Moonshadows: Conventional Truth in Buddhist Philosophy, Oxford University Press, 2011, pp. 115–116. ^ Hayes, Richard P. Dignāga on the interpretation of signs, page 53. ^ Hayes, Richard P. Dignāga on the interpretation of signs, page 35. ^ Kuzminski, Adrian. Pyrrhonism: How the Ancient Greeks Reinvented Buddhism (Studies in Comparative Philosophy and Religion), 2008. ^ a b Koller, John M. (July 2000). 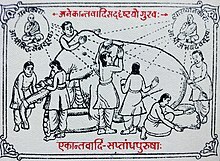 "Syādvāda as the epistemological key to the Jaina middle way metaphysics of Anekāntavāda". Philosophy East and West. 50 (3): 400–7. ISSN 0031-8221. JSTOR 1400182. Retrieved 2007-10-01. 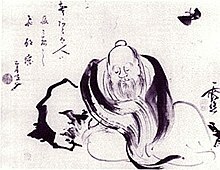 ^ a b Zhuangzi. (2013-11-26). The Complete works of Zhuangzi. Watson, Burton, 1925-2017. New York. ISBN 9780231164740. OCLC 826640070. ^ Berthel, Ken (2015-12-01). "Language in Zhuangzi: A Theme that Reveals the Nature of its Relativism and Skepticism". Journal of Chinese Philosophy. 42: 562–576. doi:10.1111/1540-6253.12215. ISSN 1540-6253. ^ Xuerong, Ouyang (December 2003). "略论王充的怀疑主义". Journal of Kaifeng University. 17-04: 11–13. ^ Annotated translations by Richard Joseph McCarthy (Freedom and Fulfillment, Boston: Twayne, 1980; Deliverance From Error, Louisville, Ky.: Fons Vitae, 1999) and George F. McLean (Deliverance from error and mystical union with the Almighty, Washington, D.C.: Council for Research in Values and Philosophy, 2001). An earlier translation by William Montgomery Watt was first published in 1953 (The faith and practice of al-Ghazālī, London: G. Allen and Unwin). ^ William James, Varieties of Religious Experience, Harvard University Press, 1985, p. 319 [= 2002 Modern Library Paperback Edition, p. 438]. ^ James Maffie (2005). "Aztec Philosophy". Internet Encyclopedia of Philosophy. This page is based on the Wikipedia article Philosophical skepticism; it is used under the Creative Commons Attribution-ShareAlike 3.0 Unported License (CC-BY-SA). You may redistribute it, verbatim or modified, providing that you comply with the terms of the CC-BY-SA.